A strong corporate image is one of the most valuable assets any business can have. 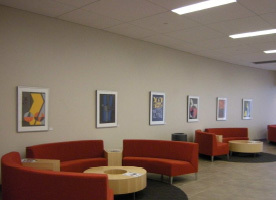 With a wealth of experience in art, consulting, and project management, Artists Archives of the Western Reserve (AAWR) can help you create an art display that will impress your current and potential clients while also being a sound investment in your company’s future. The Corporate Art Loan Program of AAWR is a membership and sponsorship feature that offers Cleveland area companies many rewarding benefits in exchange for annual financial support of AAWR and its mission of preserving this region’s art. We have a large inventory of paintings, sculptures, ceramics, prints, photographs, and mixed media from which to choose. We also work with local artists to obtain art best suited to the specific needs of our corporate clients. Let AAWR’s experienced staff transport and professionally install a display of aesthetically appealing art. No matter what your space, style, or budget requires, we promise a creative and affordable solution guaranteed to please. To learn more about enhancing your workplace with art, email us to arrange a free, no obligation consultation or call us at 216/721-9020.